South Africa are having 1-0 lead in five match ODI series against Pakistan after beating the guests by 125 runs in first ODI matches. 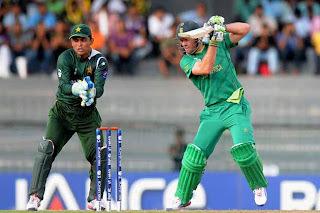 On Friday 15th March both the teams are playing second ODI in Centurion. South Africa has won the toss and elected to bat first against Pakistan. till now South Africa has scored 177 runs for 7 wickets in 38 overs. there are also high chances of Rain which is not a good news for Pakistan. After getting 3 more wickets Pakistan will look to get South Africa all out quickly and then achieve the required target. Its a day and night match and under lights the bowl will move a lot so Pakistani Batsmen will have to bat carefully to achieve the required target set by South Africa. Dale Steyn is also back in the South Africa side. Kyle Abbott is also in very good form. Update: Pakistan won the the match easily by 4 wickets.